Ignorance is always correctable. But what shall we do if we take ignorance to be knowledge? The value of managing organizational knowledge has been widely discussed. I propose that it is more important for organizations to manage their ignorance. Knowledge management strives to locate, map, collect, share, and exploit what the organization knows. Ignorance management, on the other hand, recognizes that it is never possible to know everything, or even a lot of things, well. Acting from an assumption that the organization knows enough may represent hubris at best and bad management at worst. Business organizations, however, have historically operated as though their competitive environments were known, describable, and relatively stable and predictable. Rigid planning processes, routine operating procedures, hierarchical structures and vertical command-and-control communication patterns reflect this belief. Even organizations that have adopted more flexible and responsive network forms to better deal with unpredictable environments still assume that the world is understandable and understood consistently and coherently across the organization. Those assumptions are not valid when the environment and the challenges it poses are vague, inconsistent or even unknowable. Rather than recognizing the diversity of knowledge, perspectives, values and interests that may actually exist within a firm, today’s approaches to knowledge management often assume that the shared understanding needed for effectively communicating knowledge exists. They focus on locating and sharing good answers rather than collectively formulating good questions. They do not address how to manage knowledge when the firm doesn't understand its problems, know what questions to ask, or even agree on what it knows. Organizations need knowledge management guidelines that help them recognize and respond to a variety of "knowledge problems" that have to do with what they don’t know or don’t understand. To help give some shape to the realm of organization ignorance, I define four specific knowledge problems and show how they form an integrated picture of an organization’s state of knowing. I use that framework to discuss the role of information technology in managing knowledge and ignorance. The strategic challenges faced by organizations can be framed in knowledge-based terms such as uncertainty or complexity. For example, the competitive landscape may be considered highly uncertain because the organization doesn’t know enough to predict how competitors will act. It may be seen as complex because the problems it poses cannot be addressed by known and familiar solutions. Uncertainty, complexity and related terms such as dynamism, volatility and ambiguity can serve as powerful indicators of an organization's knowledge or ignorance. These ways of describing what is known or not known have been inconsistently and imprecisely defined in the popular and academic management literature, however, so there are few coherent prescriptions on how to manage them. Consequently, organizations often end up implementing knowledge management solutions that may not be appropriate to their particular knowledge problems. What is needed is a coherent framework for describing and managing organizational ignorance. 4. Equivocality: having several competing or contradictory conceptual frameworks. Each problem describes a particular form of organizational ignorance, calling for a particular knowledge-processing capability. Each in some way also represents a fundamental organizational or strategic management problem. Taken together they define the range of knowledge processing capabilities an organization must have to manage its ignorance effectively. These four knowledge problems can be categorized along two axes: 1) the nature of the knowledge being processed, and 2) whether the solution is to acquire more knowledge or to place restrictions on what you have. These four problems may also be distinguished by the notion of restrictive vs. acquisitive processing. Complexity and equivocality require restriction to create structure and meaning. Solving problems of complexity requires the restriction of factual information; dealing with equivocality calls for restriction of diverse viewpoints or interpretations. In contrast, uncertainty requires the acquisition (or estimation) of information or facts, while ambiguity requires the acquisition of knowledge or interpretive frames. Therefore restrictive processing is generally internally focused (work with or make sense of the information and knowledge you already have), while acquisitive processing requires a search for more information or knowledge. With this basic framework in place, we can describe the four problems in more detail. Complexity can be defined as a large number of intricately related elements. Complex situations are not necessarily vague or unpredictable. Rather, the variety of elements and relationships that must be considered simultaneously is just too large to process easily5. So, for example, complex problems have many potential and interrelated variables, solutions and methods. Complex tasks are made up of many interrelated steps and factors. Complex organizations have diverse members, functions, processes, organizational units, and reporting relationships. What constitutes manageable complexity varies by person and by organization. The number of different elements and relationships that can be considered simultaneously depends on what one knows. Novices typically must deal with each element of a problem or task and their interrelationships one by one. Experts, on the other hand, can instantly recognize intricate but familiar patterns, perceiving the situation as a coherent and simpler whole6. Likewise, what is complex for one organization may be simple for another that has greater experience or expertise. Knowledge stored as intricate but familiar procedures triggered by recognizable events provides groups and organizations the ability to perform complex processes7. Bringing the appropriate level and variety of knowledge and expertise to bear on a situation helps an organization to manage its complexity. Organizations often experience uncertainty as the lack of enough information to make a decision or the inability to predict events upon which some decision depends. Uncertainty does not imply complex or vague situations or relationships; it can exist even when the range of possibilities is small, simple and well defined—for example, whether or not a roll of the dice will come up seven. There are degrees of uncertainty. Current and future states can range from being completely determined (complete certainty), to being characterized by known probabilities (risk), by probabilities estimated with some greater or lesser amount of confidence (subjective uncertainty), by unknown probabilities (traditional uncertainty), or undefined (complete uncertainty).10 In all cases, however, the context of the uncertainty is assumed to be well-defined and meaningful. Even complete uncertainty does not imply ambiguity or lack of understanding of the situation. • Acquiring, developing or improving the knowledge and ability to predict, infer or estimate sufficiently well using incomplete information. • Creating buffers such as safety stock or temporary employees. A set of alternative predictions about the state of the future in the form of business opportunities is proposed, funded and acted on. As more information is obtained (or eventually as the future reveals itself), it becomes possible to narrow those opportunities to a small number with increasing certainty and direct additional investment funds accordingly. Ambiguity means the inability to interpret or to make sense of something. 13 Regardless of the amount of information available about them, situations or events are often neither immediately clear nor understandable. Events are perceived as so new and unfamiliar that one cannot even make a vague guess about what is important or about what may happen. If uncertainty represents not having answers, and complexity represents difficulty in finding them, then ambiguity represents not even being able to formulate the right questions. No framework for interpreting or applying potential answers is available; the ability to know what clarifying questions to ask is lacking. Ambiguity is resolved either by acquiring or creating explanatory knowledge, by reinterpreting a situation to be more meaningful, or by having an interpretation externally imposed by others. Ambiguity cannot be resolved by gathering more information. It typically requires repetitive cycles of interpretation, explanation and collective agreement. Hypotheses are iteratively created and discussed until some plausible explanation emerges. Rich, interactive face-to-face conversation among a socially familiar and well-connected yet intellectually diverse set of individuals is the key organizational activity for reducing ambiguity. British Petroleum, for example, broke up its huge organization into 90 autonomous business units to encourage within unit interaction, and created peer groups among units around common problems to encourage cross-unit interaction.14 These interactions foster the growth of expertise and advice networks which can be called on when needed. Equivocality refers to multiple interpretations of the same thing. 16 Taken singly, each interpretation is unambiguous, but they differ from each other and may be mutually exclusive or in conflict. Equivocality also describes situations where there is agreement on a set of descriptive criteria (say, desirable market/ undesirable market) but disagreement either on their boundaries (for instance, the point at which markets go from being desirable to undesirable) or on their application to a particular situation (whether a particular market is desirable or undesirable). Managing equivocality requires coordinating meaning among members of an organization, and is an essential part of organizing. Equivocality arises because everyone’s experiences are unique; individuals and communities develop their own sets of values and beliefs and tend to interpret events differently. Equivocality also may result from unreliable or conflicting information sources, noisy communication channels, differing or ambiguous goals and preferences, vague roles and responsibilities, or disparate political interests. <Unless equivocality is managed, interpretations tend to diverge over time. For example, in cases where tacitly held process knowledge cannot be clearly articulated or unambiguously communicated to another person, multiple interpretations of how something should be done emerge, resulting in no single best approach to a process. Today’s popular movement towards sharing best practices in organizations therefore may be constrained by the ability to meaningfully articulate those practices. Like ambiguity, equivocality requires cycles of interpretation, interactive discussion and negotiation, but to converge on a definition of reality rather than create one. The goal is to achieve intellectual consensus rather than to leverage diversity. There is a danger, though, that overly precise or coherent policies, rules and procedures for coordinating or imposing interpretation may misrepresent the contradiction, confusion, or diversity of views inherent in a situation. In fact, sustaining equivocality may be useful for avoiding premature closure, maintaining commitment, and addressing conflicting goals. Given the prominent role that information technology is assuming in providing competitive advantage generally and in managing knowledge specifically17, the knowledge-problems framework can be used to identify areas where that technology may make its most useful contribution. The key distinction is between problems oriented towards information—complexity and uncertainty—and those oriented towards knowledge—ambiguity and equivocality. Information technology, then, can be used most effectively for managing uncertainty and complexity, where information is more factual, a high degree of interaction is not required, or the communicators share an understanding of the situation.19 Appropriate tools include decision support systems and expert systems able to process large numbers of facts, variables and relationships; database management systems with large-capacity information storage, retrieval and manipulation capabilities; online document repositories; and computer-mediated communication systems such as e-mail and online discussions that support rapid and flexible information search, routing, and communication. 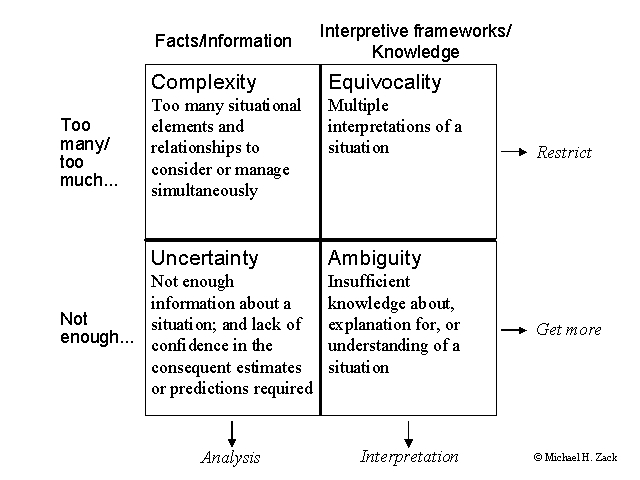 Table 1 identifies ways that information technology may be used to manage complexity and uncertainty. Ambiguity and equivocality are best managed by frequent face-to-face communication, and reliance on a flexible and responsive network of personal contacts to serve as a source of knowledge and expertise. The assumptions typically embedded into particular applications of information technology in the form of labels, definitions, procedures, and causal relationships often impose false clarity on ambiguous or equivocal situations. They may lead to erroneous "solutions" that create greater problems later. As emerging multimedia technologies offer greater richness and interactivity, they may prove useful in moderately ambiguous or equivocal situations. They still fall short of face-to-face interaction today, however. For example, desktop videoconferencing is emerging as a potential complement to spontaneous face-to-face conversation, but the speed and quality of transmission available within most organizations today is not yet sufficient to replicate that level of richness and interactivity. Information technology can also help to locate others with whom one might need to hold a conversation. It can be used to catalog the experience and expertise of organizational members, enabling easier search for the knowledge needed to make sense of something. It also enables individuals to coordinate the logistics of face-to-face meetings. Computer-mediated communication (e-mail or computer-conferences, for instance) can help to maintain continuity and connection between conversations, especially for those in different locations. To see how the framework applies to a real work situations and how the four problems relate to one another, consider the newsroom of a daily newspaper.21 When an event occurs, reporters or wire editors must attempt to make sense of what happened and to determine if it is "news." This may be straightforward when they are familiar with the situation, but difficult if they are not. I was observing the newsroom of a major daily newspaper when the student uprising in Tiananmen Square in Beijing began to unfold. Correspondents on the scene had no frame of reference within which to make sense of the events they were observing. Editors had no frame within which to interpret the reports they received from correspondents and wire services. Both operated in a state of ambiguity for several hours. Eventually, editors and the foreign correspondents on the scene began to propose and align with one of several competing hypotheses, transitioning to equivocality. Over the course of the next several hours the editors negotiated and worked toward formulating a meaningful and accurate angle for the story that would go to press. Feeding off one another’s knowledge and experience, they were able to converge on a small set of plausible interpretations. Ultimately, the managing editor approved what he considered to be the most appropriate one. Although most stories tend to be more familiar or interpretable than this one, a similar process regularly takes place. After all, "news" means something new, unexpected or unpredicted. Story angles are negotiated daily through informal but enduring communication patterns and routines, and more formally within the daily news meeting chaired by a managing editor. After a story has been unequivocally interpreted, uncertainty begins to dominate. Uncertainty reflects the difficulty of predicting the newsworthiness, quality, volatility, timing, length and placement of each story. Working to deadlines, editors must submit a publishing plan (called a news budget) to the layout desk several hours before the actual stories are filed, based on their and reporters' knowledge and experience with similar stories and situations. This budget is used to build a template into which the stories and art elements (such as graphics and photos) will be plugged. Most events can be predicted. However, a major story planned for page one, for example, may "go bust", requiring a new layout. Additional uncertainty comes from unanticipated events. Editors deal with uncertainty first by planning, based on their ability to predict quality, timing and length of stories. If they know an event will be occurring in the future (for example, a town meeting or the imminent death of a prominent person) they may have most of the story written prior to the event, or a template only needing the facts to be "plugged in". They additionally engage in constant communication with reporters and each other, much of it via electronic mail, to keep appraised of working drafts and angles. They get and exchange information constantly and maintain flexible communication networks that reconfigure to the needs of the moment. Finally, they maintain buffers in the form of so-called "evergreens," an inventory of already written stories that are relatively timeless and provide material for slow news nights, large editions, or to replace stories that do not materialize as anticipated. The process is challenged when the classification of the event is ambiguous or equivocal, typically crossing several story types or editorial departments. Was the O. J. Simpson murder case a sports, people, national, legal or page one story? When the story first broke, its classification had to be interpreted and negotiated. However, even hybrid story-types become routine over time and new procedures are created accordingly. For example, I observed a newsroom during the death of a famous actress. This event triggered their familiar "major-news-about-celebrity" routine performed collectively by the arts/television reporting department and the page-one national news department. This hybrid event had occurred often enough to have had a new procedure created and made routine. The newspapers I studied that used direct interpersonal communication for interpreting ambiguous and equivocal events performed significantly better than those that did not. Poor performing newspapers tended to overuse e-mail and other computer-mediated forms of communication early in the process and were consistently unable to develop a shared understanding of their work, necessary for coordinating the management of uncertainty and complexity later on. In contrast, newspapers where editors engaged in a large amount of "walking and talking" early in the news cycle produced a more coherent and higher quality product, relying on computer-mediated forms of communication primarily to coordinate the uncertainty and complexity that emerged later in the process. The large amount of time spent in repetitive, redundant and overlapping face-to-face conversation, considered inefficient by some, actually proved to more efficient and effective when appropriately combined with electronic communication, than indiscriminately over-using ostensibly efficient electronic communication throughout. As suggested by the example above, the four knowledge problems exhibit a natural order or hierarchy of difficulty (Figure 2). The most difficult of the problems is ambiguity, because an interpretive framework must be developed where none exists. Equivocality, representing multiple possible frames or definitions is slightly less problematic. Each, however, similarly involves managing and processing knowledge. More tractable is the case of uncertainty, where a unique interpretation has been defined, although only with some less-than-perfect degree of confidence or predictability. Finally, even a single interpretation defined with certainty may be complex, and still require considering many elements and linkages. These four problems are not mutually exclusive. For example, after an ambiguous situation has been interpreted, it may reveal itself to be uncertain, complex or both. Extensive field observations of organizations representing a wide range of industries including financial services, software, publishing, consumer and industrial goods manufacturing, professional services, and retailing suggest that the four problems do exhibit a patterned sequence. Meaning must be established and then sufficiently negotiated prior to acting on information. Ambiguity must first be resolved, often leading to equivocality as multiple interpretations emerge. Resolving equivocality creates a shared context for subsequently dealing with uncertainty or complexity, and ongoing systematic learning. LeaseCo23, a small-equipment leasing company, provides an example of how an organization can use the four-problem framework to redefine its processes and technologies for managing its ignorance. Leasing involves interpreting a customer's need for financing some asset, locating and providing the source of funds to acquire the asset, and collecting the information necessary to determine a competitive yet profitable set of terms for providing those assets. Lease transactions may be classified according to the framework. An ambiguous lease is one for which a customer's requirements do not make immediate sense or are not understood by the leasing company, often because it is so novel. With no similar experience the company has no framework to define and evaluate the customer's financial and operating needs. An example would be the first time a leasing firm financed a turnkey manufacturing or power co-generation plant. Discussion among senior management and experts from the tax, legal, sales, asset management, and economics departments are often necessary to come to some agreement about how to define and approach the lease. The customer may need to be included in a collaborative process of defining needs and capabilities. Equivocality emerges as various interpretations and approaches are developed. At this point, those defining the lease need to converge on one interpretation. If that is not possible, then a small number of competing approaches might be developed. As more information and knowledge are gathered, proposals are dropped until one survives. Once the transaction has been unambiguously and unequivocally defined, it may reveal itself to be uncertain, complex, both or neither. The factors of a complex lease are well-known and specifiable with relative certainty, but numerous and intricately related. For example, the 100th turnkey-factory lease may not be ambiguous or equivocal, but coordinating the activities of the many different departments involved is complex. Lease tracking and electronic communication systems such as e-mail and electronic discussion forums play an important role in coordination. Expert systems and decision support systems may help apply expertise to routine and codifiable problems that are too complex for less experienced analysts. An uncertain lease is one where the factors affecting price (like interest rates, customer creditworthiness, asset life and salvage value) are well known, but their particular values are not specifiable with high certainty, usually because the firm lacks sufficient historical information. The leasing firm typically performs sensitivity analysis and builds a safety factor (an information buffer) into the price accordingly. It may also attempt to locate sources of additional information, such as corroborating credit history data. Leases for many assets – automobiles, for instance - are routine, predictable and relatively simple. Typically these leases can be handled by one person supported by a lease pricing system that merely requires filling in the blanks. Each knowledge-class of lease requires a different approach and set of capabilities for its processing, but LeaseCo historically processed all leases as though they were ambiguous, convening a management meeting to pass judgment on each proposal. As the business grew, this approach placed a great strain on the lease-processing capacity of the organization, to the point where they were unable to quote on many leases. To address the problem, they first made the factors influencing lease prices as explicit as possible and gathered sufficient cost data to create a computer-based pricing model. They began classifying lease proposals into four categories, each representing a different knowledge problem requiring a different work process and application of information technology. Simple leases could be quoted from a newly created standard price list automatically generated by the quoting system for the most typical set of lease attributes. Anyone receiving a telephone sales query could quote a simple, standard lease. Complex (but predictable) leases were those for which the parameter values, while numerous and interrelated, could be specified with a high level of confidence. The quoting system computed the price, and many values were defined as system defaults. When various departments were involved, the quoting system coordinated storing and integrating the input of multiple departments. The primary customer-contact person monitored the lease progress via the system and might enter most of the information. Uncertain (and also possibly complex) leases were those for which the factors were known, but their values not known with certainty. The pricing model embedded in the quoting system provided a template or guide for identifying those uncertain factors whose values needed defining. Each department was responsible for estimating those values (or probable ranges) within its domain of expertise. The system coordinated those values, supported "what if…" profitability analysis, and computed an overall price within some range of certainty. The results of sensitivity analysis might be returned to the departments for additional estimation, and discussion to coordinate the overall estimate of uncertainty might be required. Ambiguous leases were those that could not be specified sufficiently to use the quoting system, and equivocal leases were not a clear fit. Those leases would still be processed in management meetings. Those meetings now focused on just the "difficult" leases, however. Additionally, the specific knowledge-processing goals resolving equivocality or ambiguity could be made explicit, making more efficient use of management's and experts' efforts and capabilities. The management team focused on migrating those novel transactions that became routine over time to the other more efficient lease-handling processes as the organization learned more. The quoting system provided a formal repository to capture that knowledge as it emerged. Capacity was continually freed for handling strategic novelty, and the overall knowledge-processing capability of the firm increased. Organizations also may encounter the four knowledge problems in working with the feedback they use to measure how well their day-to-day operations are performing. Internal feedback traditionally has been provided by financial variance and resource utilization reports. It may also include non-financial measures such as new product development metrics or employee satisfaction. External feedback may include customer satisfaction regarding service and quality, warranty performance, or industry benchmarking. Regardless of the feedback used, it can be complex (as is often the case with incentive and reward systems) or unpredictable in how it varies. It also may be ambiguous or equivocal if does not appear to make sense. Each problem represents a potential source of ignorance regarding the organization’s knowledge about itself. Only after these control-oriented knowledge-problems are acknowledged, identified and acted on, will the organization know enough to use its performance feedback to bring its operations back into control. Executives similarly use the information and knowledge of the organization’s control systems to formulate strategy—that is, to determine if its competitive opportunities and organizational capabilities and resources are appropriate and in balance. Those strategic decisions and actions, in turn, determine what the operations to be controlled will look like. Even though a control system might give clear, unambiguous indications that an organization is not in control, for example, by not meeting its financial or product quality targets, the reasoning behind those indications may be ambiguous, reflecting a lack of strategic knowledge about how the organization’s capabilities match its competitive environment. Consider a life insurance company, for example. At the operations level, insurance applications, like leases, may fall into any of the four knowledge classes. Most are straightforward and can be processed automatically by computer technology. Complexity is managed by using decision support and expert systems to compile, track, integrate and evaluate the various pieces of information forming an applicant’s risk profile. Uncertainty is managed by amassing and analyzing huge quantities of data describing past experience with insuring various types of risk, to build actuarial tables. Occasionally, novel cases must be evaluated and may require discussions among underwriters and medical researchers to make a best guess based on their tacit knowledge gained from experience. Often, additional expertise is brought in by involving a reinsurance company. The outcome of these unusual cases is closely tracked and new learning is systematically captured for reuse. The primary measure of control in life insurance companies is the loss ratio—a measure of how much is paid out in claims. Based on their risk management knowledge, insurance companies expect to pay out a certain amount which they hope will be no more than the premiums they receive less their operating expenses. A high loss ratio may reflect a lack of knowledge among operations personnel, or an inadequate ability to predict loss or to account for the complex set of factors affecting mortality. These are problems of complexity and uncertainty. However, a particular loss ratio may also be considered highly ambiguous if its cause is beyond the organization’s ability to understand the environment creating it. When AIDS first emerged, apparently low risk customers were dying with abnormally high frequency. This feedback was truly ambiguous until medical research provided an adequate explanation for the phenomenon. At the strategic level, executives were not able to make clear decisions about how best to serve those markets because the loss ratio measure, although itself unambiguous, was sending a strategically ambiguous message. As these examples show, organizations have lots of opportunity for ignorance and must simultaneously and continuously deal with the four knowledge problems at several levels of decision making and action. The four knowledge-problems framework provides a powerful lens for viewing information processing, communication, and knowledge management in organizations. It suggests several prescriptions and conclusions. • Organizations must be open to novelty and anomaly. Only by acknowledging its ignorance can an organization put itself on the road to learning. Organizations must recognize and accept that there are events that may be difficult to explain because no one understands them well enough. So, for example, a retail organization penetrating new markets might send personnel to live in the new market rather than rely on point-of-sale or consumer survey data, if it represents a significant departure from its normal markets. • Knowledge management today focuses primarily on solving problems of complexity and uncertainty. It aims to share and exploit what is known within well-defined circumstances and contexts, and is dominated by information technology. Expert systems apply codifiable but highly complex sets of rules; best practice databases attempt to share less structured but well-documented expertise; point of sale systems attempt to provide rapid feedback for managing market uncertainty, while e-mail and discussion databases do the same for internal uncertainty. Much less effort has been spent worrying about the ambiguous and equivocal situations resulting from more profound forms of organizational ignorance. To truly manage knowledge and expertise, however, organizations must make sure that their members work toward building a shared fundamental understanding of the situations and problems they face. Meetings and teams, as well as informal opportunities for engaging in sense-making conversations that raise good questions, challenge the status quo, and directly deal with ambiguity and equivocality are all essential. Solving convergent, well-defined problems requires having a shared understanding in place first. It is therefore critical for organizations to be aware of and to solve problems of ambiguity and equivocality before diving into the more structured problems of uncertainty and complexity. • Information technology can play an important role in managing information and knowledge, when it is appropriately applied. This requires diagnosing the nature of the knowledge problem beings solved. Information technology makes sense in cases of uncertainty and complexity, but much less so for dealing with ambiguity and equivocality. • Organizations need to go beyond their own boundaries to find the knowledge they need to help them make sense of the world. Where the organization is relatively ignorant about a market or technology, it should include the customer or vendor in the sense-making process. In doing so, the organization will also develop a shared understanding and basis for ongoing communication with its customers and trading partners. As ambiguity and equivocality give way to uncertainty and complexity, the organization can more easily migrate to more structured technologies to communicate and coordinate with its external partners. This will become especially important as more and more organizations more toward electronic commerce links. Organizations may use information technology to exchange data and information, but they will need to use social interaction to exchange knowledge in building a shared understanding about their commercial relationships. • Senior executives and managers must interact freely with those at lower levels of the organization in sensemaking and problem-solving processes to discover what the organization as a whole truly knows. It is not enough for managers merely to catalog organizational knowledge by creating a "knowledge map." Rather, they must sense the organization’s knowledge and ignorance by engaging all organizational levels in the process of resolving the four knowledge problems. • Like managing knowledge, managing organizational ignorance requires an appropriate culture. In general, the organization must create an environment in which it is acceptable to publicly admit that one does not know something. Multinational organizations I have observed find this to be particularly problematic in certain national cultures. Managing complexity requires a culture in which it is acceptable to identify and support experts and seek their advice. Resolving uncertainty requires a culture supportive of open, clear and extensive cross-boundary communication, and a willingness and ability to bridge various languages (both professional and national) in use across the organization. Resolving ambiguity requires the ability to confess ignorance and confusion. Managing equivocality requires an environment in which it is acceptable to disagree about interpretations and which accepts diversity of views as well as useful and productive consensus. • Each of the four knowledge problems suggests a different set of processes, roles, information technologies, and organizational structures for their resolution. In organizations where those problems can be segmented, it may be possible to create separate organizational units for their resolution. Often, however, those problems are intertwined. In those cases, the organization must be flexible enough to modify itself dynamically to deal with the knowledge problem at hand. For example, LeaseCo did not actually maintain formally separate units to handle each type of lease. It did, however, assign roles and responsibilities differently depending on lease type. So any particular class of lease could be viewed as being processed by a different virtual unit. One of the most effective newspapers I observed was routinely able to transform its structure, processes and use of communication technology to address the knowledge problems at hand as it progressed through the daily publishing cycle. The early stage of making sense of the day's news used a highly interactive face-to-face network of various department editors to insure a range of views, leading to equivocality management via informal negotiations and resolution by the Managing Editor in the daily afternoon news meeting. Once the "angles" on the day's news had been set, the organization managed uncertainty by spontaneously transforming itself into a broad, flexible, highly interconnected and responsive network making extensive use of electronic messaging. After the stories to run had been selected and written, the newsroom personnel reconfigured themselves into a set of "production lines" to handle the complexity of the layout process, centrally coordinated by the news desk, again making extensive use of electronic messaging. In contrast, the least effective paper maintained a hierarchical structure and centralized communication patterns throughout the process. They used electronic messaging throughout the process in a pattern that reinforced the hierarchy. Shared context was not created early on, and they lacked the responsiveness needed for making rapid decisions under uncertainty during the middle of the process. Although they were organized efficiently for production, they efficiently produced a low-quality product. >• Even the non-routine or unpredictable aspects of the four problems can be managed, or at least anticipated, in a routine fashion. 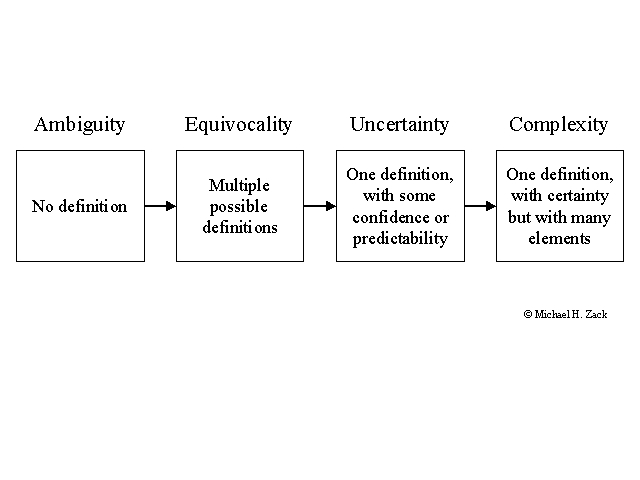 Where ambiguity or equivocality routinely arises, organizations should create standing mechanisms to address them. Provisions must be made for face-to-face conversations to occur among those most relevant to resolving ambiguity or equivocality. Those responsible for executing the resulting interpretations must also be involved so that those interpretations can be meaningfully communicated. Uncertainty can be routinely handled by anticipatory mechanisms for exchanging information; complexity can be handled by anticipatory mechanisms for locating knowledge. • The four problems suggest a framework for managing organizational learning. Ambiguous and equivocal problems often represent non-routine events about which the organization lacks sufficient knowledge. The process of resolving ambiguity and equivocality, however, is the stuff of which organizational learning is made. Ambiguous and equivocal events, if encountered enough times, eventually become familiar enough to be migrated to more routine processes. Organizations must have the ability to evaluate events to determine if they are interpretable or not, route them to the appropriate resolution process, and eventually migrate those that become familiar to routine processes, thereby reserving the organization's capacity to continually handle novelty and confusion. Organizations must move beyond operating as though they understand who they are, what they do, and what they know, to recognizing that there is always much more to learn. Knowledge management has started firms on the road to documenting and explicating what they currently know. Ignorance management will move them a stage further to managing what they don’t know. 13 Dretske, F. I., Knowledge and the Flow of Information, (Cambridge, MA: The MIT Press, 1981); Isenberg, D. J., "The Structure and Process of Understanding", Chap. 9 in The Thinking Organization, H. P. Sims and D. A. Gioia (eds. ), (San Francisco: Jossey-Bass, 1986), pp. 238-262; MacKay, D. M., Information, Mechanism, and Meaning, (Cambridge, MA: The MIT Press, 1969); McCaskey, M. B., The Executive Challenge: Managing Change and Ambiguity, (Marshfield, MA: Pitman, 1982). 17 Mata, F. J., W. L. Fuerst, and J. B. Barney, "Information Technology and Sustained Competitive Advantage: A Resource-Based Analysis", MIS Quarterly, Vol.19, No. 4, 1995, pp. 487-*; Goodman, P. S. and E. D. Darr, "Exchanging Best Practices through Computer-Aided Systems", The Academy of Management Executive, Vol. 10, No. 2, 1996, pp. 7-19; Zack, M. H., "An Architecture for Managing Explicated Knowledge", Sloan Management Review, forthcoming. 21 This example is based on observing the newsroom of four newspapers for a total of over 200 hours.